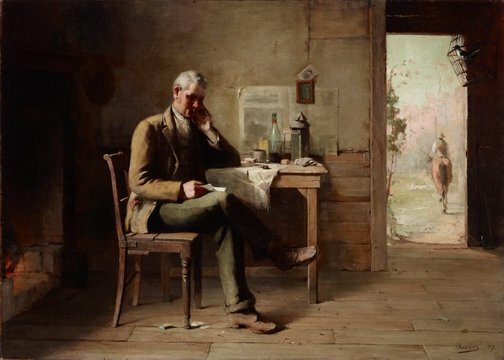 'From a distant land' is a work from David Davies' student years and reveals the academic teaching influence of George Folingsby, art master at the National Gallery of Victoria Art School from 1882. This firmly organised painting makes use of the most prevalent compositional device that flourished under Folinsgby: from a darkened room a door opens out to the glaring sun of the Australian bush, allowing the interior narrative element to expand into the outside world. Davies subsequently left Australia in 1897, spending time in France and England and encountering plein-air painting first-hand. He eventually settled at St Ives in Cornwall, where he died in 1939. Signed and dated l.r. corner, brown oil "Davies 89". Art Gallery of New South Wales picturebook , Sydney, 1972, 76 (colour illus.). Leigh Astbury., Studies in Australian art , 'George Follingsby and Australian subject painting', Melbourne, 1978, 53 (illus. ), 54. Art and Australia (Vol. 21, No. 3) , Sydney, Autumn 1983, 348 (colour illus.). Bruce James, Art Gallery of New South Wales handbook , 'Australian Collection: Painting and Sculpture', pg. 102-181, Sydney, 1999, 110 (colour illus.). Exiles and emigrants: epic journies to Australia in the Victorian era , Melbourne, 2005, 112, 113 (colour illus. ), 137. Art Gallery of New South Wales Quarterly , Sydney, Apr 1969, 454, 457 (illus.). Lynne Seear, Brought to Light: Australian Art 1850–1965 from the Queensland Art Gallery collection , ''Strapped to the Mangle': Art, Work and the 'Lady' Artist. Vida Lahey Monday morning', pg. 112-15, Brisbane, 1998, 114. Cameron Sparks., Art and Australia [vol. 16, no. 1] , 'David Davies 1864-1939', Sydney, Sep 1978, 68. Australia: A Cultural History , Clayton, 2017, 33 (illus. ).